Kidboy, Any comments on this? Let me make a comment on this just to make sure all know what happened. The pipe line that broke is the old part of Keystone not the new one which Obama would not allow, and Trump approved. The one that broke carried crude to the Chicago area, not the one which carries crude directly to Houston. It has been in operation for a number of years now, and if you live in the eastern 2/3 of the US my guess is you are using gasoline made from crude carried by it. Chasky, you are right on the money about Trump lovers who get confused and overwhelmed when dealing with facts. They are much more comfortable when dealing with emotions and Fox News propaganda, which rules their world. I gave you a Kudos but not because you said that I was right. I gave it because of your saying that they "get overwhelmed with facts" and that they "are much more comfortable dealing with emotions and Fox News propaganda". A scary truth. This is too factual for KidBoy to deal with. The 210,000 gallons is an estimate. The last time that Keystone "estimated" how big a leak was, it ended up to be a leak over ten times what they estimated. This leak could be much much more that the "estimated" 210,000 gallons. I wonder if KidBoy would like to have 210,000 gallons of this oil leaked into his back yard? Alternative Facts News Alert: It's announced that due to Trump 210,000 gallons of oil have been found in South Dakota. Reports are in that it was just lying there on the ground out in the open where no oil has ever been found. Conservatives are jubilant at Trump's success. Awwww! Kudo for that one! 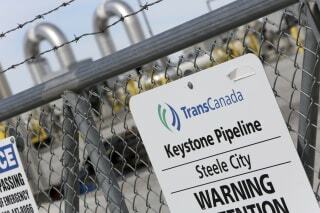 In a statement, TransCanada said the pipeline was shut off from Hardisty in the Canadian province of Alberta to Cushing, Oklahoma, and to Wood River and Patoka in Illinois. The southern leg of the system, which stretches to the Mississippi Gulf Coast, remains open, it said. The company said it detected a drop in pressure overnight and safely shut off the stretches of pipeline within 15 minutes at about 6 a.m. (7 a.m. ET). It estimated the leak at 5,000 barrels, or about 210,000 gallons, but provided no information on a possible cause or when the pipeline might reopen. Walsh said the oil appeared to be contained to an agricultural area and hadn't reached any bodies of water. My Comment: One of our posters here repeatedly posted how safe the pipeline would be and boy it didn't take long for a sizable leak to occur, did it? Native Americans and rational left wingers tried to tell ya' !!! !